Royal Philips of the Netherlands has launched an integrated marketing campaign in Australia to promote its current brand positioning and refreshed brand identity, ‘Innovation and You’. Philips says the change in messaging is to better reflect Philips’ mission “to improve people’s lives through meaningful innovation”. The campaign centres on the brand’s new visual storytelling platform ‘Innovation and You’ that features a wide range of the latest Philips innovations and showcases real-life stories from around the world behind each of them. The campaign was created in partnership with Guardian Labs Australia, the commercial content division of Guardian Australia, and is being promoted to Guardian Australia’s two million monthly unique audience, with further amplification through its digital and social channels. Over a four-month period episodes around the theme of ‘a healthier, brighter future’ aims to inspire Australian audiences showing how innovation is advancing healthcare and personal wellbeing and is transforming the way people experience lighting in public spaces and at home. 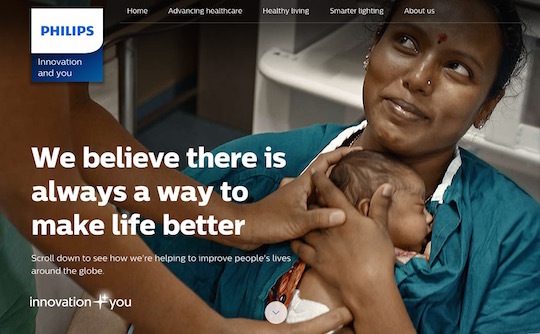 “Our commitment is to deliver innovation that matters to people, by transforming healthcare access and delivery through partnerships, improving people’s health and wellbeing and making the world more sustainable through our lighting solutions,” says Kevin Barrow, managing director of Philips Australia and New Zealand. Supported by more digital, social and PR activations, the ‘Innovation and You’ campaign will consist of rich video content, articles and interactive visualisations that showcase the individual experiences of patients, providers, caregivers, consumers and businesses alike about what Philips’ solutions meant for them in the most meaningful moments of care and how it has enriched their world being better connected.